Aside from the visual spectacle, “San Andreas” fails fantastically to be anything remotely smart. It’s not even a show piece for Dwayne Johnson’s attempt at rebranding himself into a legitimate, dramatic actor. And very little about it is surprising, new or anything most of us couldn’t write in our sleep. While “San Andreas” is trying to engage our sense of survival, it doesn’t play to an everyday fear that most of us ever experience. At least “Deep Impact,” “Armageddon” and the like had stories that I can actually remember. This one will soon be forgotten. Art Parkinson (left) as Ollie, Alexandra Daddario as Blake (middle) and Hugo Johnstone-Burt as Ben in “San Andreas”. I actually started to count the amount of cheesy one-liners that caused our entire theatre to collectively roll its eyes, but I lost count. There’s almost no intentional comedy that pays off, and worse, there’s less emotional investment into anyone who’s dying. The best line of the film is one I’d have to pick from being the “least worst”. It’s when The Rock parachutes with his ex-wife onto AT&T Park’s baseball field and says something to the degree of: “It’s been a while since I’ve gotten you to second base.” I actually laughed, which is sad, because there’s not much else to pick from. For a film that’s not trying to be a dramedy, the successful drama only draws from the city that’s being destroyed rather than the people who are suffering injury and death because of it. I felt no empathy for all the random people who plummet to their deaths, but worst of all, I barely cared if any of the main characters lived or died, too. Dwayne Johnson plays Ray: a helicopter search-and-rescue hero. The only person in “San Andreas” who the film attempts to truly earn your empathy for is Ray’s daughter, Blake. Blake is played by the stunningly blue-eyed Alexandra Daddario. Sure, I was fine looking into her eyes, but her part as the sacrificial lamb thrown into slaughter isn’t enough to make you care. 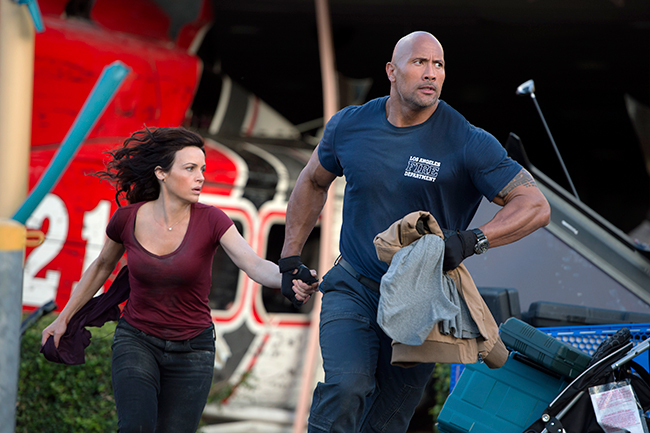 Dwayne Johnson as Ray and Carla Gugino as Emma in “San Andreas”. Even Blake’s own mother, Emma (played by Carla Gugino), is quite fine with her new main rich squeeze Daniel Riddick (played by Ioan Gruffudd) dying in all of the calamity. The actors are but mortal instruments to propel a simple story into its next rumble and crumble. The unpredictability of the destruction is the only part of the film that’s entertaining, but even it grows tiresome. Once the cracks form and the concrete buckles, it feels like the action is unrealistically relentless. For dramatic effect, of course we get to see the highest magnitude earthquake ever recorded. Paul Giamatti’s character, Lawrence, attempts to lend legitimate science to the earthquakes by finally discovering how to predict them, but the science is vaguely explained and you’re left feeling the film barely even tries to. Archie Panjabi as the reporter Serena tries to bring his genius to the masses so he saves lives, but it’s so forced. The only scene when I really cared whether or not someone lived or died was with Lawrence’s barely on-screen partner, Dr. Kim Park (played by Will Yun Lee). Carla Gugino as Emma and Dwayne Johnson as Ray in “San Andreas”. The most disappointing issue is that director Brad Peyton (who directed Dwayne Johnson in 2012’s “Journey 2: The Mysterious Island” and will again in 2016 with “Journey 3: From the Earth to the Moon”) and writers Carlton Cuse, Andre Fabrizio and Jeremy Passmore assume you’re unintelligent. They think you’re just peachy keen with eye candy that goes no deeper than the surface of doom and gloom. Now something interesting almost happened with the introduction of the English actors Hugo Johnstone-Burt as Ben and his cute little brother Art Parkinson as Ollie, but even they were overly manufactured and predictable. Of course an attractive girl like Alexandra Daddario is going to be artificially placed in the same room as a handsome guy like Hugo Johnstone-Burt so they can manufacture something resembling of a love interest. And of course it just so happens that both of these people are single. To this forgettable film’s final discredit, I just had to remind myself that mega Australian singer and songwriter Kylie Minogue is in this film as Susan Riddick. But I honestly can’t remember a single scene she’s in, and without looking it up, it’s as if her role didn’t even exist. “San Andreas” stars Dwayne Johnson, Alexandra Daddario, Paul Giamatti, Carla Gugino, Hugo Johnstone-Burt, Art Parkinson, Ioan Gruffudd, Kylie Minogue, Archie Panjabi and Will Yun Lee from director Brad Peyton and writers Carlton Cuse, Andre Fabrizio and Jeremy Passmore. The film, which has a running time of 114 minutes, is rated “PG-13” for intense disaster action and mayhem throughout and brief strong language. It opened on May 29, 2015.